First Boss Event Added: Rahovart, creates a giant arena and summons Rahovart. A new Automatic Multiple Hit Box System has been added for larger entities, this also allows for entities to have separate hit area (for attacks) and collision area (for movement and block collision) sizes. Activated altars will now spawn the rare subspecies around 10 blocks away from where the player is facing. Remobra now always drop a Poison Gland. Wendigo have a much higher chance of dropping Frosty Fur. Ooze will no longer destroy items. By default, rare subspecies spawned via altars will no long have increased stats compared to naturally spawning rare subspecies. Crusk Pets now cost the same as Serpix Pets. 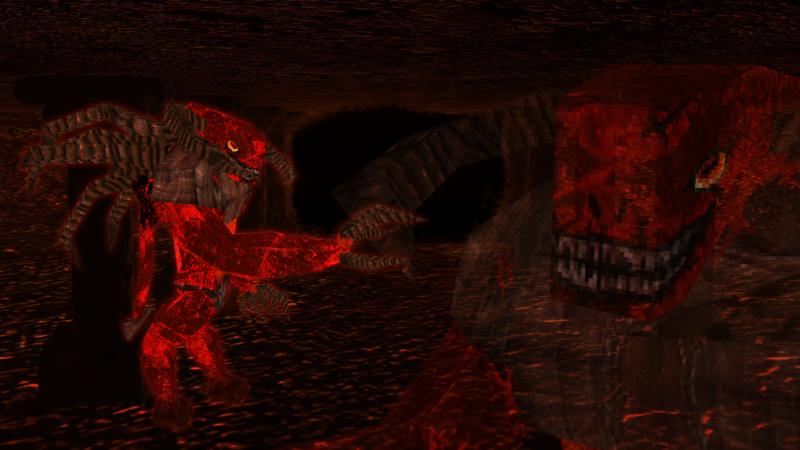 ============================================================ Lycanites Mobs Update: Lord of The Underworld - Version 1.12.0.0 for Minecraft 1.7.10 Configs older than 1.11.0.1 will be reset. ============================================================ -------------------- New Features: -------------------- First Boss Added: Rahovart (with boss event and altar) New Rare Subspecies: Ebon Cacodemon New Altars: Rahovart Altar, Celestial Geonach Altar, Ebon Cacodemon Altar New Event Type: Boss Events First Boss Event Added: Rahovart, creates a giant arena and summons Rahovart. New Blocks Added: Demonic Soulcube, Demon Stone/Tile/Brick, Demon Crystal (light source) New Items Added: Demonic Soulstone, Shadow Soulstone, Inferno Soulstone, Mountain Soulstone -------------------- Major Fixes: -------------------- A new Automatic Multiple Hit Box System has been added for larger entities, this also allows for entities to have separate hit area (for attacks) and collision area (for movement and block collision) sizes. -------------------- Balancing: -------------------- Activated altars will now spawn the rare subspecies around 10 blocks away from where the player is facing. Remobra now always drop a Poison Gland. Wendigo have a much higher chance of dropping Frosty Fur. Ooze will no longer destroy items. By default, rare subspecies spawned via altars will no long have increased stats compared to naturally spawning rare subspecies. -------------------- Minor Fixes: -------------------- Crusk Pets now cost the same as Serpix Pets.